One week ago, I was riding in 80 degrees; I took the winter lining out of my Joe Rocket jacket and packed away my winter gloves. 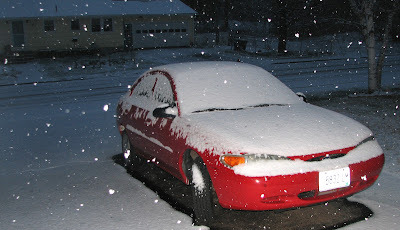 Just a few minutes ago, I snapped this picture of my wife's car. Oh ha-ha-ha. Pessimists are saying, "I told you so." Optimists are saying, "I quit!" My winter gear is back from its winter storage in the basement. BUT - I hope to leave it in its box until next fall. Part of being a Mainer is a heavy reluctance to admit to being wrong. For example, a true Mainer who took the snow tires off his truck too early would almost rather skid off the road in a late spring ice storm than agree with his neighbor that, "You shoulda left 'em on 'til May, Henry." "No suh, Ben - I got a hell-of-a deal on new summers, had to do it by last Saturday for the discount." Check Henry's tires - same old rubber from last year, but no admission of being wrong. A year ago it was 29F for the ride to work and we still had a snow to come. Today it was 68F for the ride to work and 81F for the ride home. That said, I ain't washing the ACF-50 off of the Symba until at least tax day. I guess I'm one of those pessimists. Wisconsin is going to see a white landscape tomorrow. Northerners understand. We may not like it, but we understand our weather. Enjoy a nice bowl of vegetable soup!